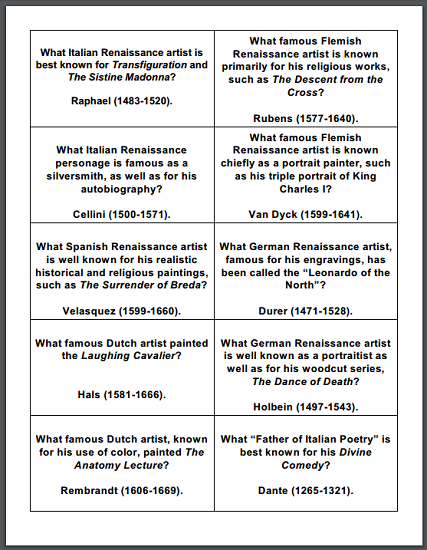 These are two sheets, each with ten question cards (twenty question cards total) on the European Renaissance. 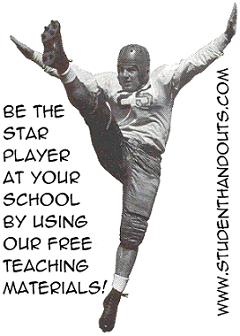 These are a fun way for groups to review for a test. The game board and instructions are here. Question cards are below. Click here to print the first sheet: 1. Renaissance is a French term meaning what? Rebirth. 2. What multi-talented Renaissance personage is considered to be the “first modern man”? Leonardo da Vinci (1452-1519). 3. The Renaissance period saw a renewed interest in what earlier time period? Classical (ancient Greece and Rome). 4. What Renaissance artist painted the famous Mona Lisa? Leonardo da Vinci(1452-1519). 5. What ten-letter word means the language of the common people? Vernacular. 6. What Italian Renaissance artist is renowned for his statue David? Michelangelo (1475-1564). 7. What Italian artist designed a famous set of bronze church doors in Florence, Italy? Ghiberti (1378-1455). 8. What Italian Renaissance artist painted the ceiling of the Sistine Chapel? Michelangelo (1475-1564). 9. What Italian artist is best known for his sculptures of figures on horseback? Donatello (1386-1466). 10. What Italian Renaissance artist is well known for his use of color, especially red, in works such as Assumption of the Virgin? Titian (1477-1576). Click here to print the second sheet: 1. What Italian Renaissance artist is best known for Transfiguration and The Sistine Madonna? Raphael (1483-1520). 2. What famous Flemish Renaissance artist is known primarily for his religious works, such as The Descent from the Cross? Rubens (1577-1640). 3. What Italian Renaissance personage is famous as a silversmith, as well as for his autobiography? Cellini (1500-1571). 4. What famous Flemish Renaissance artist is known chiefly as a portrait painter, such as his triple portrait of King Charles I? Van Dyck (1599-1641). 5. What Spanish Renaissance artist is well known for his realistic historical and religious paintings, such as The Surrender of Breda? Velasquez (1599-1660). 6. What German Renaissance artist, famous for his engravings, has been called the “Leonardo of the North”? Durer (1471-1528). 7. What famous Dutch artist painted the Laughing Cavalier? Hals (1581-1666). 8. What German Renaissance artist is well known as a portraitist as well as for his woodcut series, The Dance of Death? Holbein (1497-1543). 9. What famous Dutch artist, known for his use of color, painted The Anatomy Lecture? Rembrandt (1606-1669). 10. What “Father of Italian Poetry” is best known for his Divine Comedy? Dante (1265-1321). Click here to print the third sheet. 1. What "Father of Italian Prose" is famous for The Decameron? Boccaccio (1313-1375). 2. What Renaissance Spanish writer mocked feudalism in Don Quixote? Cervantes (1547-1616). 3. What Italian political writer is well known for The Prince, a guidebook for tyrants? Machiavelli (1469-1527). 4. What Renaissance Portuguese writer described the history of his country in The Lusiad? Camoens (1524-1580). 5. What French vagabond poet is well known for his Testament and Ballad of Dead Ladies? Villon (1431-1485). 6. What English writer, executed by King Henry VIII, described an ideal state in Utopia? Thomas More (1478-1535). 7. What Renaissance French satirical writer wrote Gargantua? Rabelais (1494-1553). 8. What famous English dramatist wrote Volpone? Johnson (1573-1637).9. What French Renaissance writer is known for pioneering the essay? Montaigne (1533-1592). 10. What English writer is thought to be the most famous playwright in the world thanks to plays such as Macbeth and Romeo and Juliet? Shakespeare (1564-1616). Click here to print five sheets of these game cards together.